So called “over-intervention,” such as the use of Caesarean sections, ultrasounds, and antibiotics when not needed, are costly for health systems and can be dangerous for women and newborns. In addition, it calls attention to whether women are being allowed to make decisions about their own health care under pressure. The biggest finding from The Lancet series, a comprehensive update on the current maternal health landscape around the world, was the diversity of remaining problems and widening divergence in key indicators based on geography and socio-economic level. Many countries are improving, but the drivers of maternal deaths and disabilities have expanded in others and there is a large gap between the wealthy and the poor. Interventions that can be characterized as “too much, too soon” are one of these relatively new problems. Whether it is performing routine induced and augmented labors instead of allowing them to develop naturally, or administering antibiotics to women after childbirth for no reason, these practices may be lifesaving in some circumstances but are costly and harmful if done regularly. One example is Caesarean section (C-section) births. Among the 81 countries surveyed by The Lancet, C-section rates ranged from 2 percent of deliveries (Timor Leste) to 59 percent (the Dominican Republic). Middle income countries typically have the highest rates. Experts are alarmed by such high numbers because a C-section is a major procedure that can involve serious complications like bleeding and infections and longer recovery than normal vaginal deliveries. The increase in C-sections stems from a drive to medicalize care as much as possible, but has resulted in a decline in quality and respect for some patients, said Miller. Other alarming cases of too much, too soon include artificial induction of labor (rates range from 2 percent in Paraguay to 71 percent in Iran), augmented labor (from 1 percent in China to 79 percent in India), and episiotomy (from 17 percent in Georgia to 92 percent in Thailand). Quantity Over Quality in India? India accounts for the highest number of maternal deaths of any country in the world. Each year, some 45,000 women die from complications related to childbirth. To bring that number down, the government launched a major program to encourage institutional deliveries in 2005, called Janani Suraksha Yojana. Deliveries in government hospitals increased by 22 percent, deliveries in private hospitals by 8 percent, and home births declined by 16 percent, said Myriam Vuckovic, assistant professor at the international health department in Georgetown University. However, the public health infrastructure has been unable to fully support rising demand. Nationwide, there is a 77 percent shortage in obstetrics and gynecology care at community health centers, and in 15 states and union territories there is a 90 percent shortage of obstetricians and gynecologists. As a result, the quality of services has suffered in many places, and over-intervention along a number of lines has become common. Uterotonic drugs, pubic shaving, enema, induction and/or augmentation of labor, intravenous infusion, episiotomy, lithotomy position for delivery, and manual revision of the uterus are all techniques that are overused in Indian hospitals and clinics, said Vuckovic. According to The Lancet, 79 percent of Indian mothers in 2011 were given oxytocin during their first and second stage of labor in order to speed up delivery, despite the World Health Organization recommending use of oxytocin only during the third stage of labor. Often, the widespread, inappropriate application of some techniques, like the use of oxytocin, are tied to prevailing cultural beliefs and lack of knowledge regarding proper storage, dosage, and administration of the drug, said Vuckovic. 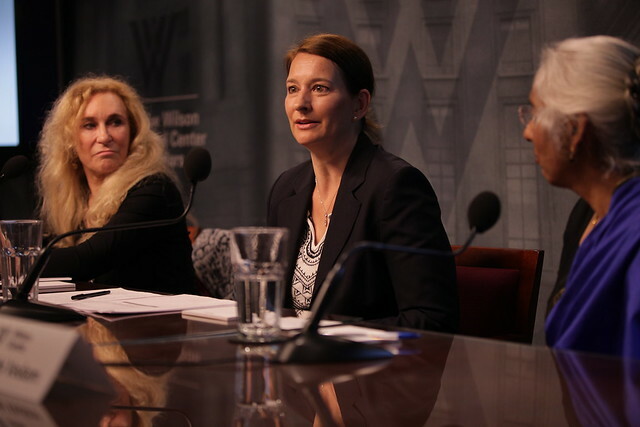 Successful maternal care is neither “too little, too late” nor “too much, too soon,” said the panelists. Miller suggested the sidelining of midwives, sometimes considered “unskilled attendants” and often disrespected in health systems, has contributed to the problem. “The best outcomes with the fewest interventions and lowest cost is midwifery-led care,” she said. Vedam and her team created two indexes for women to score autonomy and respect and polled four working groups from 35 different communities, including women who have been incarcerated and women from communities of color. Study topics addressed access and preferences for care as well as participants’ knowledge of midwifery. “Overall, what we found actually was that it wasn’t whether or not [women] had the intervention, it was whether or not they felt involved in the decision-making – it was whether or not they felt pushed into it, coerced into it,” Vedam said. Ultimately, it’s the choice and feeling of informed decision-making that seemed to matter most to women, no matter the setting or their background. “Care isn’t really quality care without respectful care,” said Miller. Cover Photo Credit: A patient in Mexico City, November 2015, courtesy of the Pan American Health Organization.